"We had the most amazing time at High Desert Eden! Our hosts, Robin and Max, were wonderful and the scenery was quite simply breathtaking. Photographs cannot even begin to do this landscape justice. The sights were incredible, and Robin and Max were a delight. We are from New York and could not have asked for a more romantic getaway. The first thing my boyfriend said each morning was, "It's amazing how quiet it is out here," because we are so used to the buzz of a big city!" 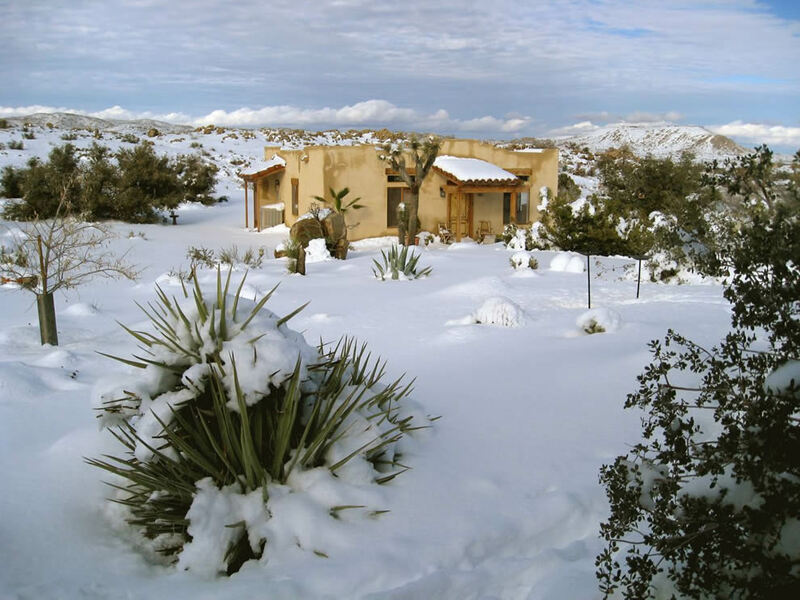 "I have stayed at the 'casita in the desert' several times now, and each time it's just a magical experience. 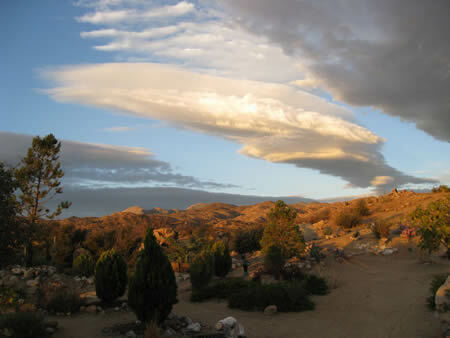 I write, hike, relax in the peaceful silence of this secluded desert land. The casita is just the right size for comfort and coziness, and the unobstructed view of the stars at night will take your breath away. There are no words to describe the night sky overhead, and the serenity of the land will sooth your mind. Max and Robin are excellent hosts who leave you to your peace and quiet. You're on your own time -- turn off your cell phone, leave the city behind if only for a few days. But it's enough to re-generate your soul." The High Desert Eden Casita is a 900 square foot house (1 bedroom, 1 bath) with a 200 square foot screen and tile-roofed porch. It is available for stays of a weekend, a week or longer. We are open year 'round. Continental breakfast foods are provided for the first three nights of your stay. You'll arrive Friday afternoon and depart on Sunday afternoon. Included are lodging at the casita; four yoga sessions of your choice with Max; and four healthy gourmet meals (two dinners, two breakfasts, and fresh fruit available all day). Max will also show you around the 22-acre High Desert Eden sanctuary so you can find your favorite places for private time and meditation. • There is one queen bed in the bedroom and two singles in the living room. A second queen bed is on the screened sleeping porch. At the moment, while longer-than-weekend stays can be arranged, full retreat services (meals and yoga) are not available. • All reservations require a 50% deposit at time of reservation. We accept all major credit cards. • If your plans should change and you find it necessary to cancel your reservation, we would appreciate knowing as early as possible. • If you cancel your reservation more than 21 days prior to arrival, your deposit will be refunded less a $25 cancellation fee. • If you fail to cancel your reservation, any deposit paid will be forfeited. • We regret there are no refunds or credits within 24 hours of arrival date for early departures, late arrivals or cancellations. • The balance owed on your reservation is payable on arrival. • Refunds will be given for cancellations received less than 21 days prior to arrival subject to our ability to fill the reservation and less a $25 cancellation fee. If we cannot fill your cancelled reservation, we will extend to you a credit for the amount of your deposit to be used for another stay at High Desert Eden within 12 months of your originally scheduled stay. • The balance owed on your reservation is payable 21 days prior to arrival. • Refunds will be given for cancellations received less than 21 days prior to arrival subject to our ability to fill the reservation and less a $25 cancellation fee. This means that if we can make another reservation, we will happily refund your money (less the cancellation fees). Otherwise, we regret we can make no refunds. • Check-in is between 3 PM and 6 PM. We are happy to accommodate early and late arrivals, but it is necessary for you to notify us in advance so that we are sure to be available. • We do ask that departures be made by 12:00 noon so we have time to prepare the Casita for our next guests. We will always try to accommodate late departures. Winter holiday season and New Year's celebrations are especially exciting in the high desert.